Habitat: Most species found in deserts. Some species found in grasslands, caves, woodland areas and even in the Himalayan and Andes Mountains at altitudes of over 12,000 feet! Diet in the wild: Mainly insects but also includes spiders, centipedes and other scorpions. Diet in the zoo: Insects, mainly crickets. 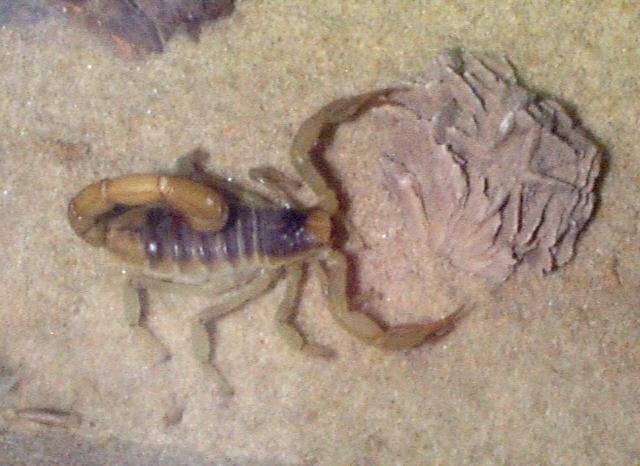 The Desert Hairy Scorpion can reach lengths of up to five inches. Usually yellow in color, although some have been found to be dark yellow or light brown. Scorpions are members of the Phylum Arthropoda. The members of this genus are the largest scorpions found in the United States. Most scorpions live from three to five years, although some are known to live over 10 years of age. Scorpions have a protective outer covering over their body. This structure, called the carapace, is secreted by their epidermis and is consisted of a polysaccharide called chitin. This exoskeleton is durable and somewhat flexible, giving scorpions protection without hampering their movement. The body is made up of two segments, the cephalothorax and the abdomen. At the conclusion of the abdomen a new structure begins to take form; this is the telson. This is commonly called the tail and is composed of 5 segments which contain the venom glands. 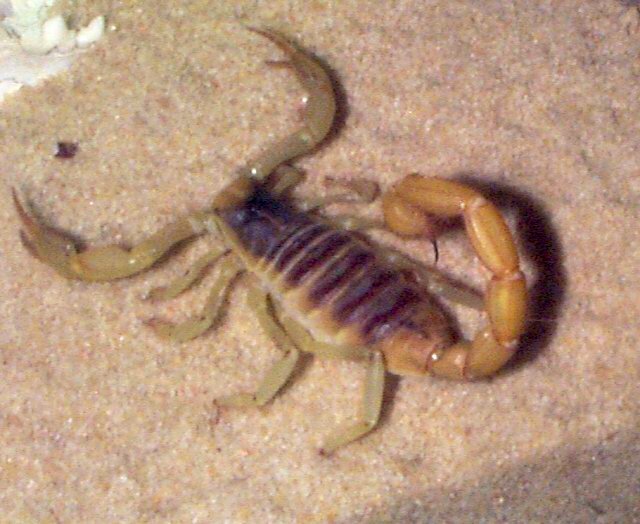 The creatures included in the sub-phylum Chelicerata with scorpions are: spiders, horseshoe crabs, ticks and mites. The term chelicerata describes special adaptations used by these organisms when feeding. Chelicera are spiny, masticatory processes that are used to help break down food on its way to the mouth. Another interesting property of scorpions is that they fluoresce blue-green under black light. The use to which the scorpion itself puts this property is unknown, but it is a property of all scorpion species. Fluorescence appears shortly after the scorpion molts and intensifies as the new cuticle hardens. The fluorescence is seen even in dead scorpions, so it seems to be a permanent part of the cuticle. Just as a special note: Despite common beliefs, scorpions do not always inject their venom when they sting. If a feeding scorpion is strong enough to overpower its prey it will hold it and eat it alive. The reason for this is that it can take up to two weeks for a scorpion to regenerate its venom, which would leave it defenseless in a desperate situation.